Utilizing a unique specialty in deep and technical diving, the Cambrian Foundation has conducted variety of data collection projects for environmental scientists, marine geologists, archaeologists, and historians, as well as local, state, and federal agencies in many corners of the world. Cambrian Foundation - does that? The Cambrian Foundation has two unique characteristics that set us apart from other research and conservation organizations. 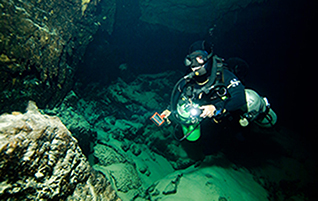 First, we have a specialty in deep and technical research diving, which enables us to collect data for scientists, archaeologists, governmental agencies, military installations, etc., in places where most people cannot go. Cambrian Foundation - does that too? Since its inception the Cambrian Foundation has been doing presentations at schools and community groups worldwide to teach people about the importance of maintaining clean waters for our planet, and the excitement and wonder of underwater exploration, with the hope that students and teachers would join the Foundation on an actual research expedition. 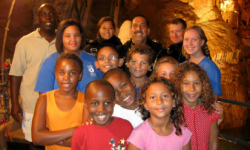 Dedicated to research, education, preservation, and exploration of the aquatic realm! Utilizing a unique specialty in deep and technical research diving, the Cambrian Foundation collects data for environmental scientists, marine geologists and biologists, archaeologists, and historians, as well as local, state, and federal agencies in many corners of the world including deep offshore environments, shipwrecks, and submerged caves. Interested in learning more about the underwater world? 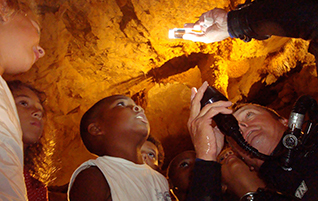 We offer presentations to classrooms and community groups, field workshops, internships, and expedition participation. Our unparalleled approach to hands-on education provides people of all ages with many different ways to become involved. The Cambrian Foundation dive program incorporates a variety of tools for the research, recovery, survey, etc. work that we do underwater. 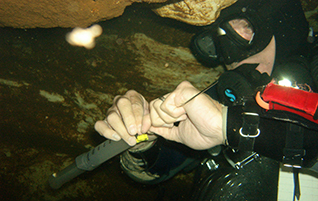 These include open circuit, semi-closed rebreathers, and closed circuit rebreather systems. The Cambrian Age occurred about 500 million years ago and lasted for about 80 million years, during which all life was confined to water. It is also the first geological age from which we have recovered a good fossil record. The most familiar fossils of the Cambrian Period are the Trilobites, the bug-like ancestors of today’s crustaceans. It is this reason that an image of Trilobite fossils is used by the Foundation.